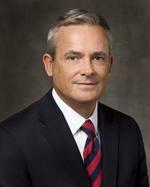 Elder Patrick Kearon, 48, had been serving as a member of the Third Quorum of the Seventy in the Europe Area when called to serve in the First Quorum of the Seventy at General Conference, April 2010. In May 2017 he was assigned to serve in the Presidency of the Seventy effective August 1, 2017. Elder Kearon was educated in the Middle East and the United Kingdom. He has lived and worked in the United Kingdom, Saudi Arabia and the United States in various industries, including health care, food, automotive and transport. He currently runs his own communications consultancy. Civic and community involvement has included service on the boards of a charity, a school, an enterprise agency and a college. After joining the Church on Christmas Eve, 1987, Elder Kearon has served in numerous Church callings, including assistant ward clerk, ward Young Men president, bishop’s counselor, branch president, and stake president. Patrick Kearon was born in Carlisle, Cumberland, England on 18 July 1961. He married Jennifer Carole Hulme in 1991. They are the parents of four children, one of whom is deceased. The Kearon family lives in Somerset, England. This page was last edited on 10 September 2017, at 16:30.